Nike has a commercial on its website that I absolutely love. It shows people throughout history running with a purpose. We see a warrior is charging into battle, a scout is warning others of an invasion, a gunslinger is running out of a Wild West town and a police officer is chasing down a suspect. The commercial then cuts to a guy on a treadmill at some grey, urban gym and asks what our motivation is. Check it out, it’s a fun thirty seconds. Though I’m relatively new to the sport of running (just a few months, and only two races), I’ve developed quite an appreciation for it. There’s a splendid rawness to running that no other sport can provide. And while I love football for the armored warriors battling each other in a rigidly time contest on a gridded field, I love getting out and running for the exact opposite reason – all you need are sneakers and ground. Running is, in some ways, an anti-sport. We watch football to see gladiators fight for ground. We are enrapt by watching a baseball player hit a ninth inning homerun. We immerse ourselves in the unadulterated frenzy of college basketball. We gawk at the strongest, fastest people on Earth and engage in wild fantasy about being one of them. Arliss Michaels got it right at the beginning of that spectacular show of his. “We cheer them, we live through them, athletes are our last warriors.” But when we see a runner run, there isn’t that mythic divide between spectator and sportsman. The boundaries of entry to that world aren’t nearly as high. You don’t need a contract or sponsors. You don’t need to get a scholarship or develop a fanbase for jersey sales. All you need are sneakers and ground. I think that the most amazing thing about running is its accessibility. 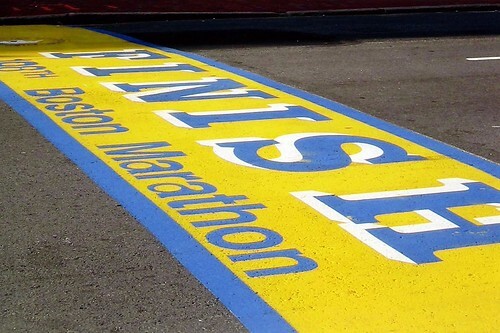 If you wanted to run the Boston Maratho n, and be shoulder to shoulder with the greatest runners in the world, you can! There are countless charities that can make it happen. If you want to spend your life improving your 5K time, you can! If you want to talk to a lifetime runner and feel like you’re an equal, you can! Running satisfies a different part of your soul than football or baseball. Those latter two are no longer sports of the people. Long gone are the days where players had to work offseason jobs to make ends meet. The ability to relate to them just isn’t there. But runners are just like us – people that get up, eat a hearty breakfast, put on their shorts and go jogging. I think that’s why folks that watch the marathons cheer so loud. They’re cheering on their peers. If any of you are looking for a New Year’s Resolution, how about giving running a shot? If my experience is any indication, you’ll feel more connected to the world of sport than any football message board, $50 baseball seat or hockey sweater ever will.